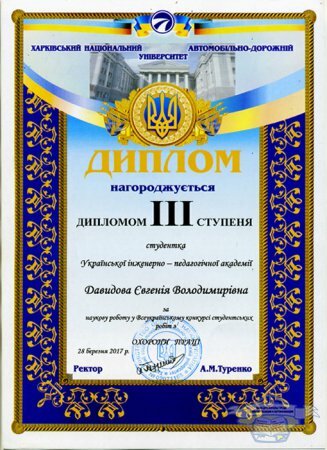 The National University of Civil Defense of Ukraine awarded the winners of the second stage of the All-Ukrainian student research in the field "Civil defense and fire safety." Industry Competition Commission II stage of Ukrainian student research in the field "Civil defense and fire safety" provided a review of 58 student papers received from 27 universities. April 30 in the conference hall of the institution vice-rector of civil defense, Colonel Vladimir Andronov presented awards. 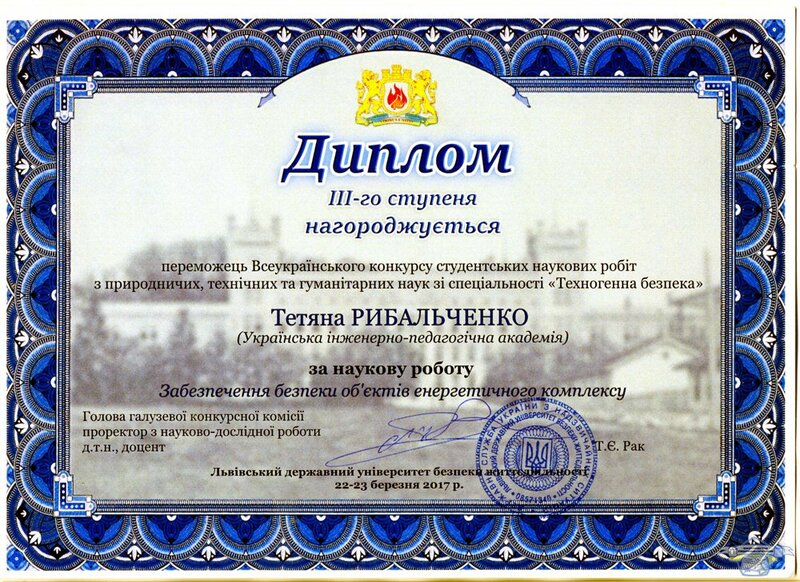 Diplomas and degrees awarded Oksana Pustovit from the Ukrainian Engineering and Pedagogical Academy. Congratulations to Oksana with the victory and wish further success in teaching and scientific work! All-Ukrainian student research in the field "Labour Safety"
March 28, 2017 in the Kharkov National Automobile and Highway University hosted the All-Ukrainian competition of student works in the field of "Labor Protection". Student gr. ДЕА-ПОО16мг. Yevgeniia Davydova received the diploma of III degree. We wish them further success in their studies and research work! All-Ukrainian competition of student's works on the specialty "Technogenic safety"
22-23 March 2017 at the Lviv State University of Life Safety held All-Ukrainian competition of student works in "Technological safety". Student gr. ДЕА-ПOO14 Rybalchenko Tatiana received a diploma of the ІІІ degree. We wish you continued success in your studies and scientific work! 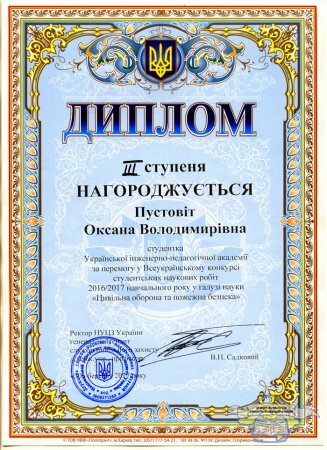 In Ukrainian competition of student papers from the field of science "Applied geometry, engineering graphics and ergonomics" Ivanna Solodovnik, student gr. ДЕА-ПОСт13+ПОСт14пр, II took place. Supervisor student - assistant professor Department of Labour Safety, Standardization and Certification Yulia Lys. We wish you continued success in teaching and research work!